M4V - M4V format is one of the formats used for video pod casts, based on a codec used by the QuickTime. This codec is part of the MPEG-4, a global multimedia standard and this standard was introduced to provide optimized video pod casts for the video iPod. QuickTime is multimedia software that is used to display synchronized graphics, sound, video, text and music. This was introduced Produced by Apple Computer Inc.
MOV - MOV is a file extension used by the QuickTime-wrapped files. The format was created by Apple Computer to work with multimedia files. Though MOV files are quite often found in the web, to play them on Windows computer one has to install an extra component or convert to other format. MOV is a container format and can contain video, animation, graphics, 3D and virtual reality (VR) content or text (for subtitles, for example). If you want to convert M4V to MOV, the best choice is M4V Converter Plus. It is an ideal M4V to MOV Converter which can remove DRM protection from iTunes M4V rentals and convert them to plain MOV at 30x speed. In order to convert iTunes M4V rentals to MOV, you can go to try M4V Converter Plus. 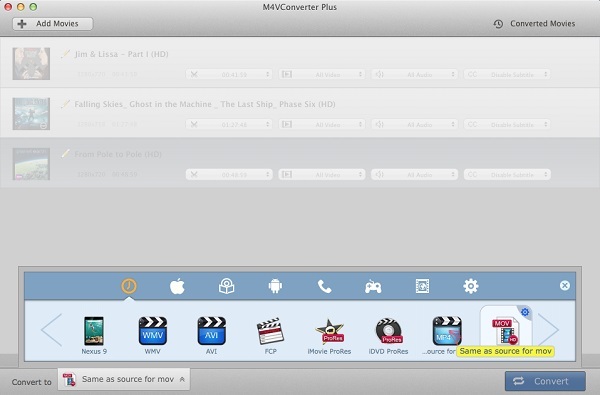 It is an all-in-one M4V to MOV Converter for Mac users. With it, you can remove DRM protection from iTunes movie rentals and convert M4V to any video / audio formats at will. Friendly & simple user-interface allows users to convert iTunes M4V rentals to MOV with simple clicks. 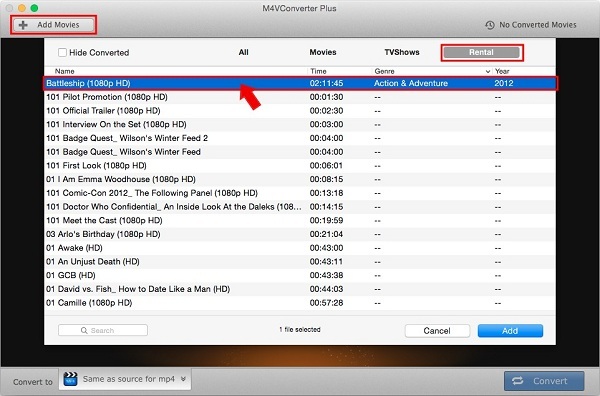 Let us refer to the following simple steps to convert iTunes M4V rentals to MOV on Mac. 1. Add iTunes movie rentals to the converter. 2. Set MOV as output format. From format profile, select "Same as source for mov" as output format. 3. Start converting iTunes M4V rentals to MOV. Click the "Convert" button to get the conversion started.